I get inspiration for my books from my life and experiences. The inspiration for my book The Pony Game came from playing with my dog as a child. My novel Backstage Betrayal deals with a fear of mine. Our Secret Place is based on a real experience that happened to a friend when he was a teenager. Eye of the Future explores a favorite subject of mine. 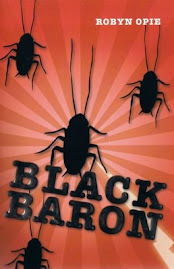 Black Baron appeals to my sense of humor and desire to save all the animals in the world. Stop! 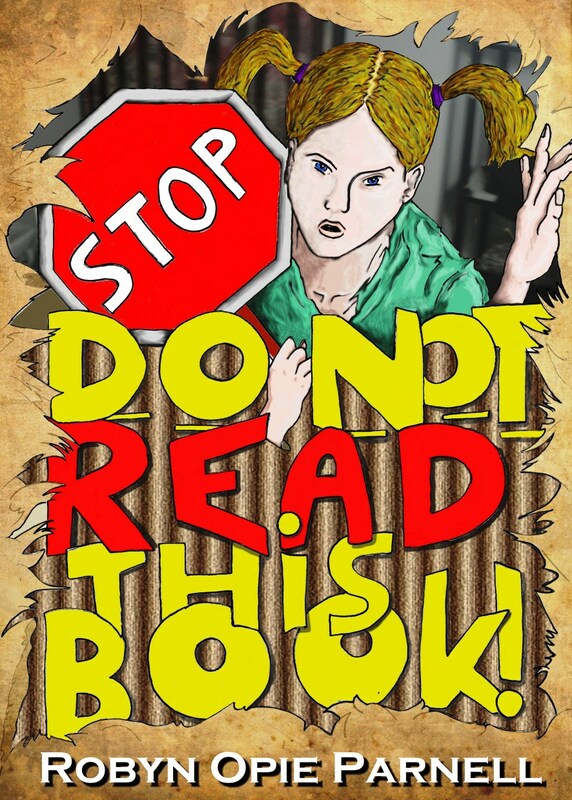 Do Not Read This Book was inspired by the idea of someone hating books and hating to read. I was interested in opposites with this story because I love books and love to read. What kind of children’s books do you write? I write fiction and non-fiction books for children. I write all sorts of children’s books for children as young as 5 to children as old as 15. I like to read fast-paced, action-packed, humorous stories, so I tend to write these types of stories. 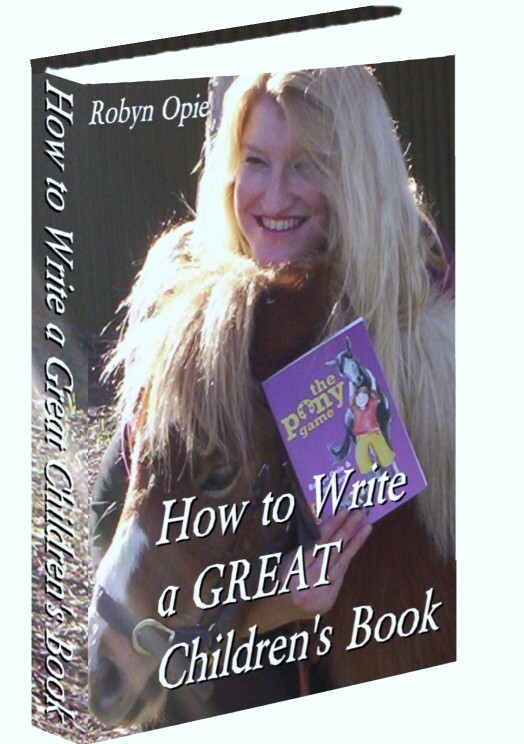 Please visit Senia's blog - http://simplysenia.com/2012/10/30/senia-interviews-childrens-book-author-robyn-opie-parnell/ - to read the rest of this interview. Thank you, Senia, for interviewing me. Senia is a very smart, hyper, and cute 10 year old little girl that loves chocolate, science, reading, and the (☮) peace sign. Her mother is Dangerous Lee! Senia's blog will cover tween and teen topics, parenting tips, as well as artwork, photos, videos, book reviews, and other cool things that Senia shares as she grows up to become a woman. Half Price! All Proceeds to Animals Australia! Please help! Today, I watched a TV advert from Animals Australia. I'll admit that the TV advert made me cry. I so badly want to see the animals find their place. I so badly want to help pigs fly. So, here's the deal ... A half price special! This week, I'm selling my e-book How to Write a Great Children's Book for $15 and all proceeds go to Animals Australia. How to Write a Great Children's Book usually retails for $27.95. But if you help me raise $150 to donate to Animals Australia, you can have my e-book for the special price of $15! BUY NOW for $15 and I'll donate all proceeds to Animals Australia. Please share with anyone you know who wants to write children's books. Please help me to raise $150 for Animals Australia. How to Write a Great Children's Book - BUY NOW - and help the animals find their place! My goal is to raise at least $150. Please spread the word. We all win. You get How to Write a Great Children's Book at approximately half price, we get to donate to Animals Australia, and the animals receive our help. What a great deal! After your payment, please allow 12 hours for me to email you a copy of How to Write a Great Children's Book with my personal "thank you". The following is from an interview I did for Sharon Ledwith's blog: I Came. I Saw. I Wrote. Thank you, Sharon! 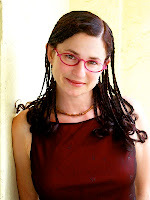 I want to thank and welcome author Robyn Opie Parnell for sharing her personal writing journey with us on my blog today. Her featured book, Maya and the Crystal Skull, can be purchased from Amazon, and other on-line bookstores. How long have you been writing, Robyn? I wrote my first novel when I was fifteen – an Australian version of Nancy Drew. In my early twenties, I submitted a 2,500 word picture book to publishers. I thought the book was brilliant. I loved it. Publishers, unfortunately, didn’t agree. But I didn’t know back then that picture books are usually less than 700 words and never ever more than 1,000. Oops! It’s a good thing we live and learn. Around mid-nineties, I read books and completed courses on writing for children. My first three books were accepted in 1998 and published in 1999. The three books are still available today. They are My Bike, Jen Stays Inside, and People Need Trucks. 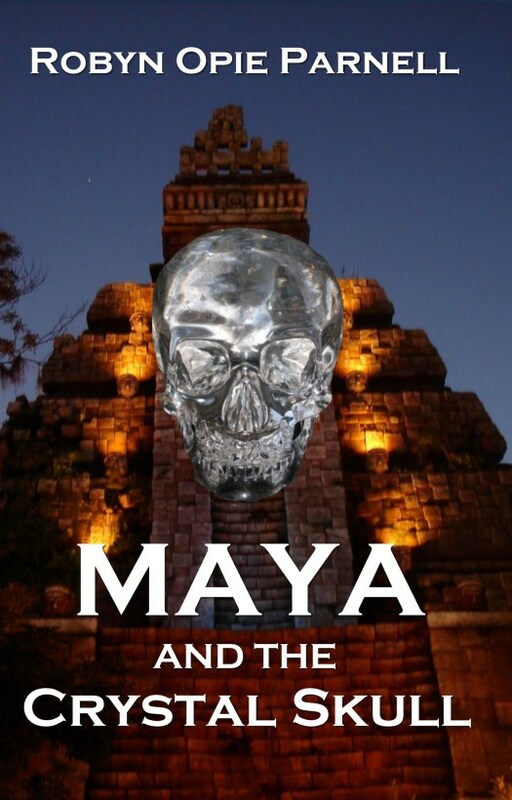 Where did you get your idea and inspiration to write Maya and the Crystal Skull? To read more of my interview, please visit Sharon Ledwith's blog: I Came. I Saw. I Wrote. Would you have liked to have been part of a ghost club? Absolutely! Alongside my nanna, most likely. My nanna wasn’t your regular cake-baking, round, hugging kind of grandmother, she was feisty, no-nonsense and used to tell me stories about ghosts. True stories, that were passed down through the family and this sparked a life-long love of all things ghostly. So how did your ghost club come about? Partly because of Nanna but also because this year was the 200th birthday of Charles Dickens, who not only claimed to have seen ghosts but also was the founding member of the Ghost Club 150 years ago. (The club still meets today to investigate ghostly sightings.) I decided to create my own club where two of the most successful catchers are 11-year-old twins, Angeline and Edgar Usher. Like the real clubsters, they investigate haunted sites and try to convince the ghosts to stop their pesky ways. How does your ghost club work? It is run from a ramshackle mansion in Gravesend and is headed by Grandmaster Fleischmann. Regular meetings are held to discuss upcoming conferences, welcome new members and discuss the latest ghostly sightings. Professor Grandma Rose is the chief inventor and in charge of the Spectorium, where all the equipment is kept and Endora Spright is the Head of Spectral research and looks after the archives, museum and investigating the history of haunted sites. I never start out with one but the more I get to know my characters, one always stands out and this time it’s Mr Roderick Gloom, former ghost catcher and groundsman of the club. He keeps unusual pets like piranhas and tarantulas and fancies himself a bit of a poet, where, to the dislike of newest member Dylan, the characters always seem to meet a dismal end. Yes, but I have only seen one. It was late at night when I was climbing into bed. I reached to close the curtains when, outside the window, I saw the face of my nanna. After a few moments she faded away. I drew the curtains, had a strong feeling that Nanna was looking out for me and had a very calm, restful sleep. 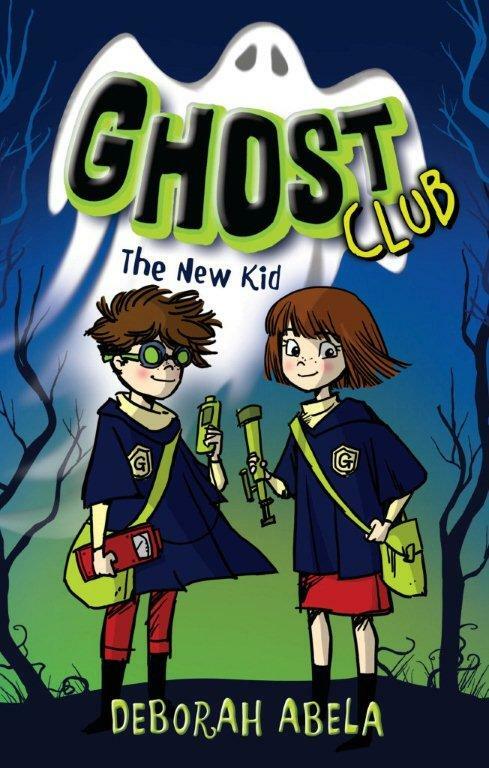 What kind of kid do you think will enjoy Ghost Club? Kids who are about 8-12, enjoy adventure, mystery and a bit of fun, ghostly peskiness. Thank you, Deborah, for including my blog in your blog tour. All the best with Ghost Club. Thank you so much for being involved, Robyn. It's been great fun. Deb knew she wanted to be a writer when she was 7 years old. Her first story was about a man made out of cheese. It wasn’t very good. She’s had much more practice writing since then and strangely enough her first writing job was for a kids’ show on channel Ten called Cheez TV. After 7 years of writing scripts about everything from llamas to bungy jumping and how to go to the toilet in outer space, Deb wrote her first novel - Max Remy Superspy Part 1: In Search of the Time and Space Machine. 1. Determine your target age group. Before you start writing you need to determine the target age group you want to market your book to and then begin researching that age group. Read as many books as you can that are geared towards that age group so that you can start to see what each author does that works and that doesn’t work. This will help prepare you to write your own book that is tailored to that demographic. 2. Write from the perspective of the children. One of the major downfalls of children’s books is that the author is writing about children of a certain age, but they lack a full understanding of that age group, making them unable to accurately portray events and objects from their point of view. When you write you have to remember that you’re an adult, so you’re going to see things differently. Get down on the floor to view rooms, check out kids’ TV shows and the games they are playing, run across the playground and play on the playground equipment – become the age of your characters so that you can really write from that perspective. 3. Include elements of humor. Whether your book is meant to be comical, mysterious, or sentimental you should include elements of humor throughout it. Kids enjoy humorous situations that they can relate to – even if it’s just a paragraph to lighten the mood. One great example of using humor to connect with the children you’re writing for is the book Stop! Do Not Read This Book! by Robyn Opie Parnell. This humorous book deals with some of the trials and tribulations that kids go through during adolescence, but does so with an element of humor that engages kids to keep reading. 4. Take the reader on an adventure. Every good story will have a hurdle that the protagonist will need to overcome before they reach a resolution and gain understanding of why something happened and how it’s affecting them as an individual. In Robyn Opie Parnell’s book Maya and the Crystal Skull, Maya has to deal with the fact that her mother has passed away and her father has gone missing. Maya is thrown into a historical adventure that has her uncovering clues that take her closer to understanding exactly why certain events in her life have happened. To write a good children’s book you need the protagonist to go up against different obstacles like this and come out stronger in the end. 5. Include a lesson at the end. At the end of a children’s book children should be able to take away some sort of lesson from the story. Maybe it’s to never give up, maybe it’s that everything happens for a reason, maybe it’s to respect your parents – whatever it is, they should have a clear understanding of this lesson without it feeling like they were being lectured throughout the book. Writing children’s books is no small feat, but when they’re written correctly they can have a lasting impact on the children who read them. Sam has two pet hates, books and having her mum call her Samantha. In fact everyone in Sam’s house loves books. They are devoted to the written word so much that even when the electricity is off they use candles to see to read. But worst of all her mum writes books. Sam likes to watch DVD’s and play computer games. Reading is not for her, even at school. She always finds a way to escape to the sick bay. The school nurse is almost her best friend. The family pet, Huckleberry the Dachshund, has a farting problem that young readers will enjoy. Sam thinks his gaseous explosions are chemical weapons of mass destruction. Finally the family takes Huckleberry to an Earth Therapist for treatment. To their relief his farting becomes less frequent and smelly. Fate strikes a double blow at Sam. Her mum is about to launch her new book. 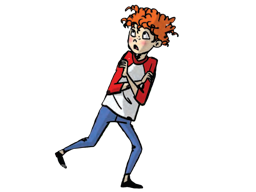 Sam is distressed when her mum comes into the classroom to talk about the book. The class thinks that the girl in the story, who has a bed-wetting problem, is really Sam. Sam denies this but her denial reinforces her friends’ belief that the girl is her. This misunderstanding leads to series of incidents, including a fight with her best friend Emma, which causes a lot of grief and embarrassment for Sam. She sinks into a world filled with frustration. Her mother’s effort to help Sam makes matters worse. Sam hates her lot in life and is desperate to find a solution to her own secret problem. The story has a twist that will delight readers and make them happy for Sam. Robyn Opie Parnell has written a delightful tale of about the trials of growing up with a problem that is hard to share. Her choice of words make the story sparkle and builds a strong empathy between the reader and Sam. This is a book I highly recommend for all middle grade readers. To read the review of Goodreads CLICK HERE. To purchase the PDF e-book of Stop! Do Not Read This Book CLICK HERE . To purchase the Amazon Kindle e-book of Stop! Do Not Read This Book CLICK HERE. To download Chapter One of Stop! Do Not Read This Book by Robyn Opie Parnell absolutely free CLICK HERE.